Please note Full Members, Associate Members and Junior Members are eligible to enter and compete at the National Championship Show. Temporary membership is only available for non SSA members who wish to enter the HOYS class 75. Polo Shirts, may be ordered in advance and will be in Competitors’ envelopes, or available for collection from the Show Office. 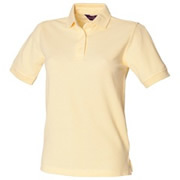 Polo Shirts may be ordered from the Show Office for delivery after the Show. You can order online when making your "Show Entry". Orders can be placed in advance for collection at the Show or ordered during the show for delivery after the Show. 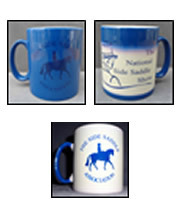 SIDE SADDLE ASSOCIATION NATIONAL SHOW "Magic Mugs"
When you pour in any hot drink/ water, these amazing mugs fully reveal the Side Saddle Association on one side and National Side Saddle Show Logo on the other side (Porcelain so breakable). Limited Stock will be available for purchase at The Side Saddle Association AGM and at The National Side Saddle Show. Catalogues, may be ordered in advance & will be in Competitors’ envelopes, or available for collection from the Show Office. You can order online or when making your "Show Entry" OR using the paper Entry Form. Orders can be placed in advance for collection at the Show or purchased during the Show. For those wishing to enjoy a Formal Lunch on one or more of the 3 Show Days, tickets may be purchased for the Judges’ & Sponsors’ Marquee, which overlooks The Hutton + Rostron Arena. Tickets, MUST BE PURCHASED IN ADVANCE, and include a Welcoming Drink, Main Course, Dessert and Tea or Coffee. Appropriate dress is appreciated. Tickets numbers are limited. You can order online or when making your "Show Entry" OR using the paper Entry Form. Orders must be placed in advance (No later than the Entries closing date). Falthwaite Grange, Falthwaite Green Lane, Hood Green, Barnsley, S75 3HL. The National Side Saddle Show Group (NSSSG) is unable to give specific recommendation to any commercial concern, and can accept no responsibility for any commercial arrangements entered into and does not operate any social media sites including, but not restricted to, Facebook, Twitter, LinkedIn, Google Plus or YouTube, etc. and any information that may be shared on these sites does not represent the views of The National Side Saddle Show Group. 1. Facebook, Twitter and other social networking sites of a similar nature are popular with Competitors, Judges, Instructors, Show Visitors, etc., for communicating and sharing information and pictures. 2. Inappropriate and offensive comments of any nature will not be tolerated under any circumstances – this includes remarks about the NSSSG. 3. Any person found to be making such remarks in a related group will be removed from the group without explanation. 4. Inappropriate images of Competitors and Show Attendees must not be posted, in the interest of fairness and to prevent miscommunication. 5. No alias or pseudonym may be used to circumnavigate this use of social media statement.